"Call to the Dance" "Return of the War Party"
Couse said "I want it to be strictly American." and was recognized as Bouguereau's favorite student. Eanger Irving Couse uplifted the American peoples ideas of the West and Native Americans. is listed on the National Register of Historic Places and the New Mexico Register of Cultural Properties. The property is also called the Couse/Sharp Historic Site, and is maintained by the Couse Foundation. It is open to the public. 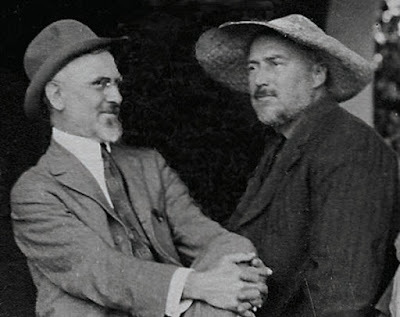 He achieved the highest reputation of the Taos Founders. 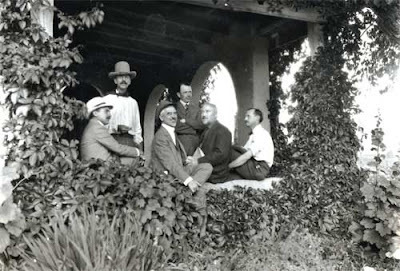 William Herbert Dunton, Bert Geer Phillips, and Joseph Henry Sharp, and also the first president of the Taos Society of Artists. He was a printmaker, graphic designer, illustrator, muralist, plein air and easel painter and Kachina doll maker. gouache, etchings, pens and inks, colored pencils and charcoal. pastoral landscapes, skyscapes, and national and state parks. Arizona; Mystic, Connecticut; and Arizona Before 1945. Eanger Irving Couse' Teachers include William Bouguereau and Tony Robert-Fleury. 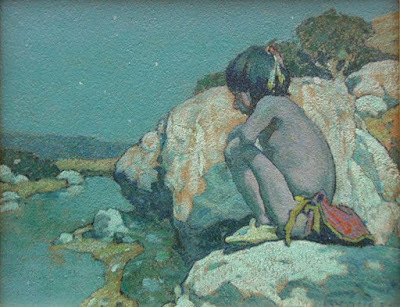 Eanger Irving Couse' schools include Academie Julian, National Academy Museum and School, School of the Art Institute of Chicago. Parsons does not offer Eanger Irving Couse prints, because no print can compare to the real paintings. Couse, also called Irving (Eanger) Couse, was born in Saginaw, Michigan, on September 3, 1866. 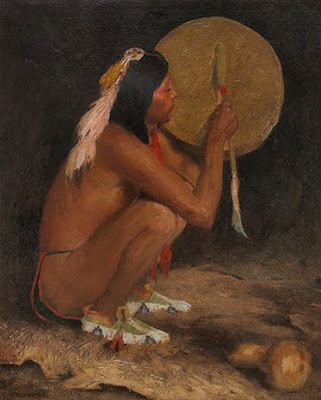 He started drawing the nearby Chippewa Indian Tribe in his youth. 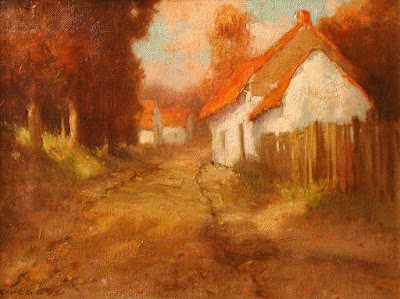 In 1884, at the age of 18, Couse studied for 3 months at the Art Institute of Chicago, until he ran out of funds. 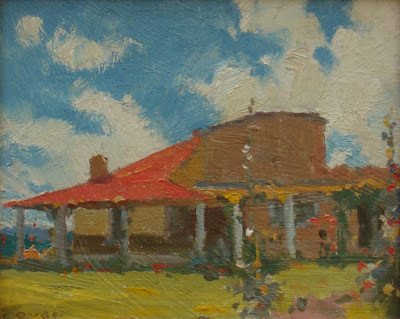 He painted houses to earn his tuition. In 1885 he went to New York City. From 1885-1887 he studied at the National Academy of Design in New York, winning awards every year. 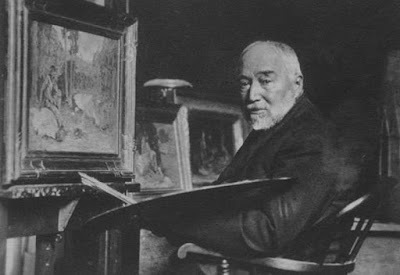 In 1887, Irving Couse traveled to Paris, and studied at the Academie Julian under William Adolphe Bouguereau and Robert Fleury. He won awards for four consecutive years. He was Bouguereaus' favorite student. Bouguereaus' classic technique and draftsmanship show in Couse art works. 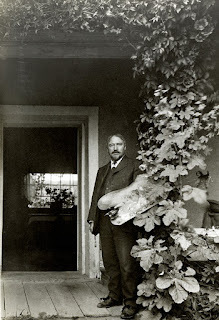 In 1889 he married Virginia Walker, his fellow Paris art student and a ranchers' daughter from Oregon. 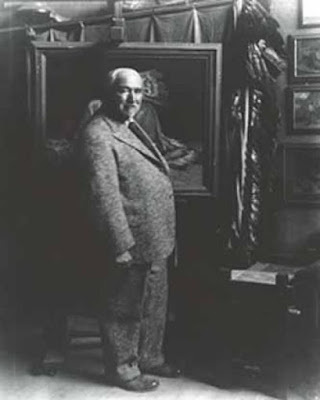 In Paris, he mentored under Joseph Henry Sharp, the spiritual leader of the Taos Founders. 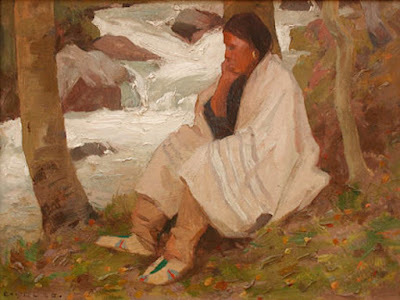 In 1891 he moved to America and went to Oregon, and painted his first Indian portraits of the the Yakima, Umatilla, and Klikitat tribes. 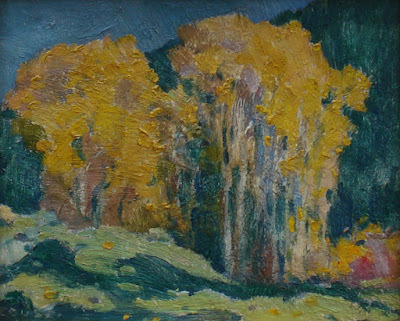 Irving Couse also painted landscapes, which were more in demand in those days. at the Portland Art Association in Oregon, and later at the Paris Salon of 1892. Eanger returned to France and lived in Pas de Calais. 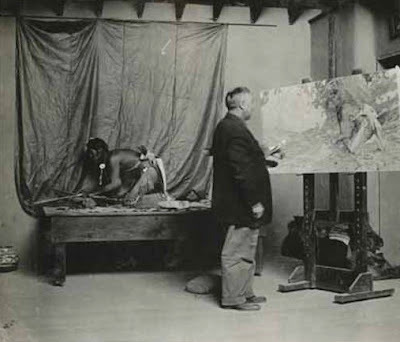 Between 1893 and 1896, he was part of the Estaples art colony. His son Kibbey was born in Estaples in 1894. 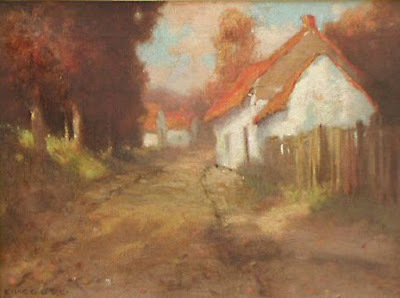 In 1897 Couse and his family moved to Oregon. 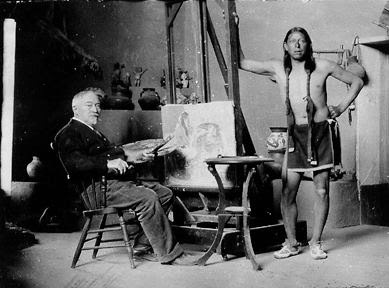 He built a studio and painted the nearby Klikitat Indians. 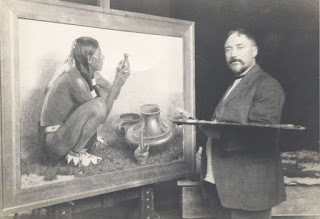 as a source for his popular Native American paintings. 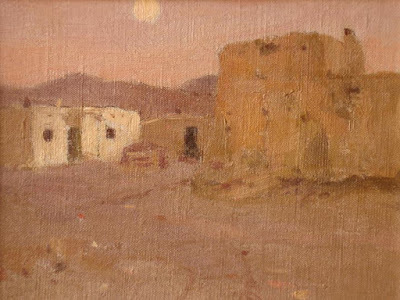 In 1902 he went Taos, New Mexico for the first time, on the recommendation of Joseph Henry Sharp, his Paris friend. 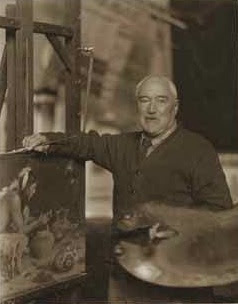 EI Couse also maintained his contacts and a winter studio in New York, which helped to sell his Art Works. 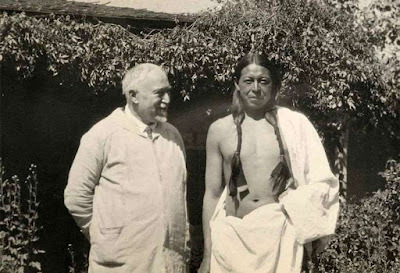 In 1903 Couse went to Arizona and at Walpi he potrayed the Hopi Indian ceremonies. 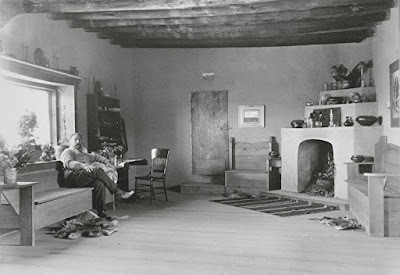 From 1902 to 1926 he spent all his summers in Taos, New Mexico. He lived next door to Bert Geer Phillips. 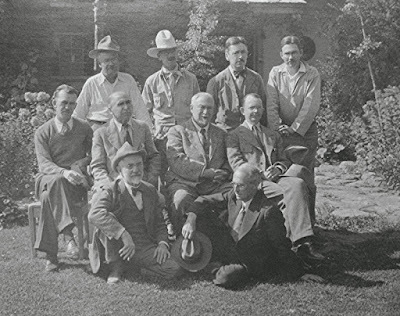 along with Joseph Sharp, Bert Phillips, Ernest Blumenschein, Oscar E Berninghaus and Herbert Dunton. 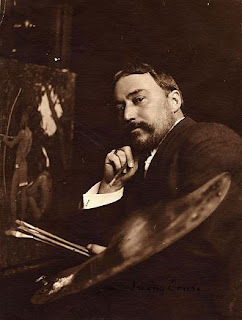 In 1911 EI Couse was won full membership in the National Academy of Design. 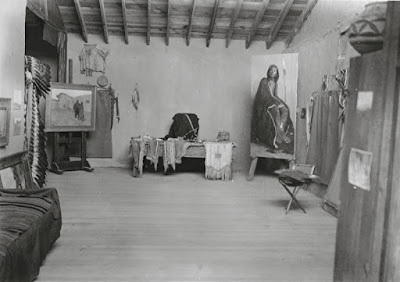 In 1912 Eanger was elected the first president of the Taos Society of Artists. 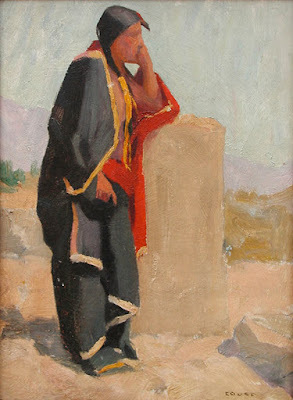 Ben Lujan and Geronimo Gomez of the Taos Pueblo were Couse main models. Looking at his paintings, one can see them age over the years. 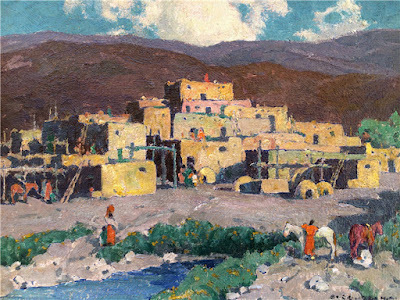 Starting in1914, artist Eanger Irving Couse signature paintings were on calendars by the Santa Fe Railway. He painted 22 important pieces for the railway over his life. 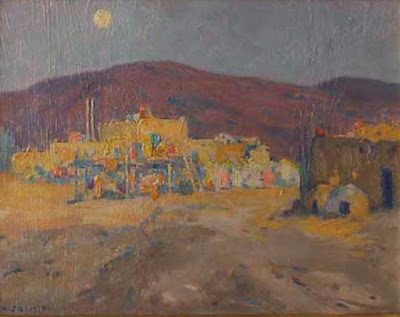 In 1927 Couse moved to Taos, New Mexico full time. 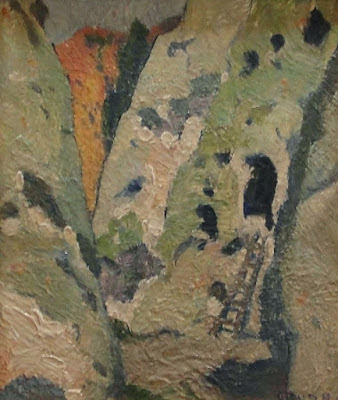 In 1927 Eangers' wife died, saddening him and changing his paintings. 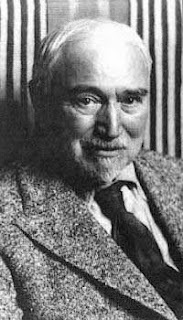 Eanger Irving Couse died in Albuquerque, New Mexico in 1936. He is buried at Sierra View Cemetery in Taos. "A Vision Of The Past"
"The New Rug, a.k.a./The Indian Blanket Seller"
"Indian Camp in the Cascade Mountains"
"White Tipi Nocturne and Chamisa"
"The Call of the Flute"
“The First American” 1928, oil on fabric support, 46" x 35"
"The Housewife Looking at the Fisherman's Catch"
"Tree Trunk" Oil on Board, Circa 1910, 7" x 9"
"Twining Canyon, Taos" Oil on Board circa 1910 13 " x 10 "
"The Water Jug" Oil on Canvas, 20.25" x 24.25"
"Landscape" Oil on Canvas Board, Circa 1920, 4" x 5"
"Couse's Backyard" Oil on Panel, 6" x 5"
"Landscape - Hayfields" Oil on Canvas, 9" x 12"
"Moonlight Spring" Oil on Board, 9" x 12"
"Couse's House" Oil on Canvas Board, Circa 1910, 9.5" x 11.5"
"Aspen" Oil on Canvas Board, 9" x 11"
"Taos Landscape" Oil on Board, Circa 1920, 6" x 5"
"Taos Pueblo - Moonlight" 1914 Oil on canvas, 60 x 60 in. 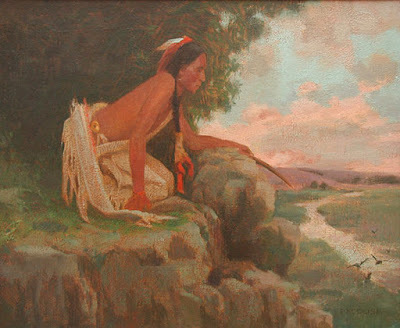 "The War Bonnet" n.d. oil on canvas, 24 1/8 x 29 in. 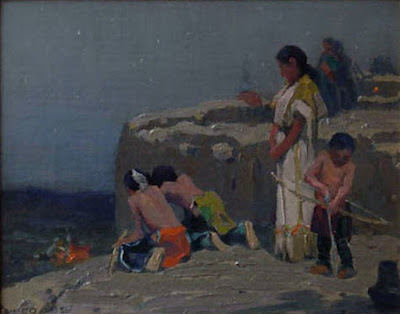 "Corn Ceremony" n.d. offset lithograph mounted on canvas 15 1/2 x 19 1/2 in. 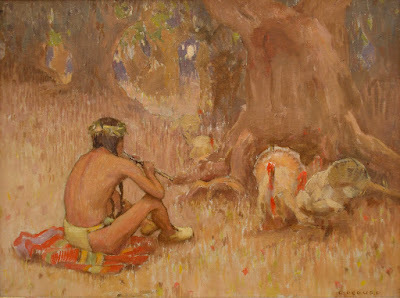 "Elk-Foot of the Taos Tribe"
"Indian Seated by a Campfire"
and was elected the first president of the Society.